Gillman Speedway came about as the result of the closure of the nearby North Arm Speedway in Marck 1997. The area at Gillman, which was effectively the car park for the Moto Cross track, was covered by truck loads of dirt and rubbish, but the race was on to get a track down by the summer to allow continuity of the sport without a break. A small 213 metre track was formed using dolomite from the old North Arm track, and used tyres for a safety fence and after an early try out in October, the first official practice was held on Sunday, 19 October 1997. Low key practice meetings were held on a more-less- monthly basis while a larger 400 metre track was also formed, with just a basic dirt surface, the 400 metre track was approximately where the current track is, while turns one and two(for solos) of the larger track doubled as the main straight of the smaller track which ran North South. The first full meeting on the larger track was held on Saturday, 16 May 1998. For two years we continued to run low key meetings monthly, usually on Sunday afternoons, until November 1999 when we held a practice session under temporary lights. 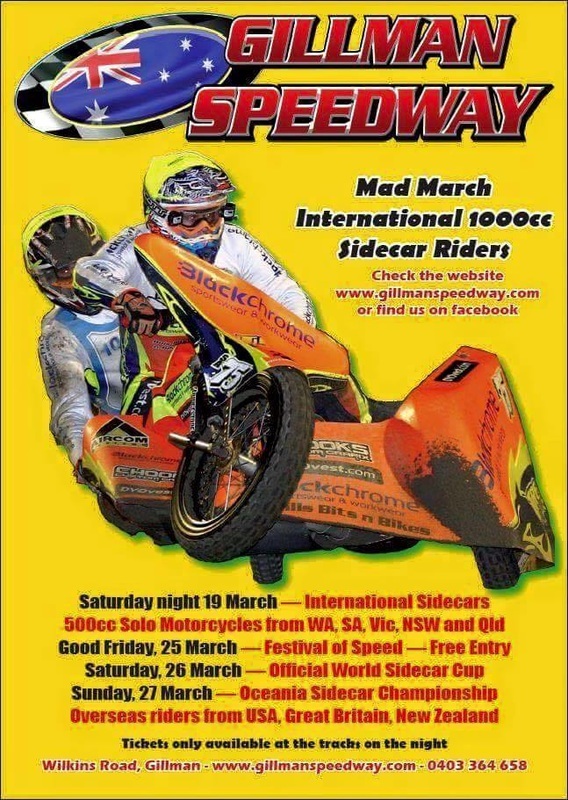 The practice went well and on Friday, 7 January 2000 we staged our first night meeting which was the South Australian Solo Championship, A second night meeting featuring Australian Sidecar Champions Glenn and Nathan O'Brien was held on 24 March 2000. Throughout this time work was continuing on turning the venue into what we now have. With the financial help of a couple of people and the manpower of a few more interested people riders and parents, over the winter of 2000 we levelled the existing two tracks and built the 295 metre track we have now. Still using the generator-powered temporary lights the new track successfully opened on Australia Day (25 January) 2001 with the staging of the Jack Young Solo Cup and the Harry Denton Memorial Sheild for sidecars.